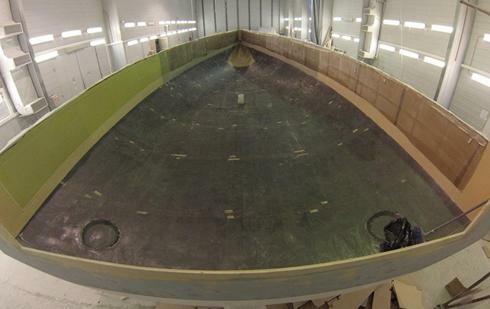 Owen Clarke’s 12m lifting keel shallow draft performance cruising yacht being built in Chile is coming along nicely. Since this picture of the de-moulded, predominantly S-glass/Corecell foam hull the team building Alwatross have been installing the structure for the retracting bowsprit and throw-arm anchor launch system. Production is at a steady but slow pace while the yard concentrates on the delivery of several Chris White cruising catamarans. 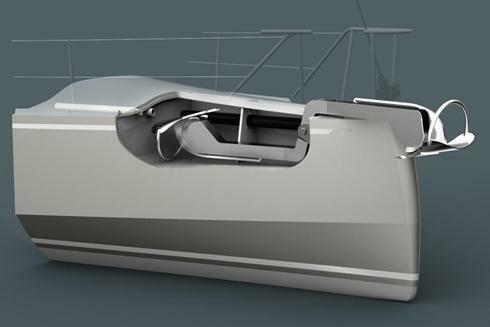 Meanwhile lead designer Allen Clarke in co-operation with the client and design staff at the shipyard are completing the design of a significantly different coachroof and deck layout to that which we previously published. We don’t have a name for it yet; let’s call it Option #2, more on that in the coming weeks/months.